Did you know these prickly things? 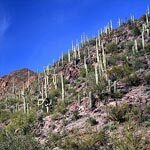 Speaking about desert cactus species we can name the following: ariocarpus, carnegiea, cephalocereus, cephaloceus, echinocactus, ferocactus, opuntia, and some others. When we hear the word “desert” we usually imagine Sahara or Kara-Kum with their scorching sand-dunes devoid of any vegetation. 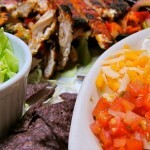 But the soil of stony deserts of Central and South America is very rich in all necessary salts for cacti. 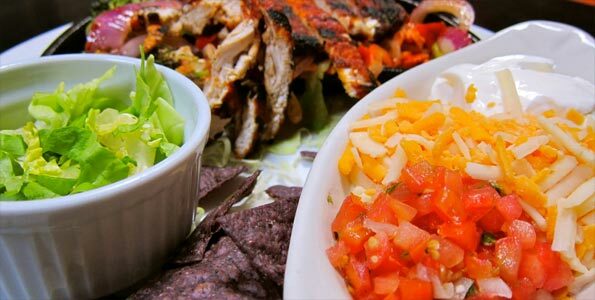 Though its contains very little amount of humus, water dissolves salts and the plant can absorb them. But if rains are extremely rare here, where does water comes from? Plentiful dews, falling at night and flowing down between ribs of cacti, the night fogs accumulating on prickly stalks – this is a poor water diet of desert types of cactus growing in Mexico, Peru, and Ecuador. Roots of many cacti of these places are radish-shaped and are capable to save water within, or ramify widely near the surface. 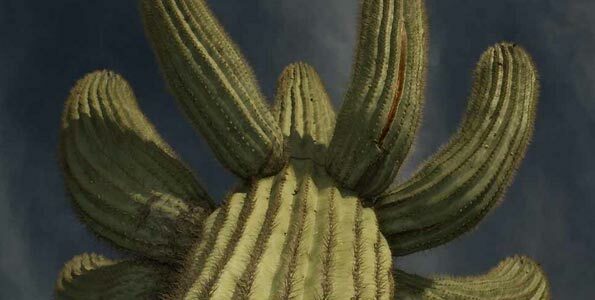 To reduce moisture evaporation, cacti aspire to curtail the area of the stalk surface. That’s why they have either spherical or a short cylindrical form. Desert cactus types are not afraid of burning sun: some of them have thick and dense thin skin, which becomes flat and “hides” in the ground for the period of droughts; some have high sharp ribs causing shade; others are covered with dense prickles or setae, looking like a brush. 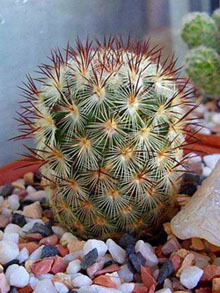 For their correct development desert types of cactus require much sun, soil containing little humus and careful watering. They can easily die because of water stagnation in the ground even during summer heat. The word savanna usually means vast territories of grass plains, covered with herbage, isolated islets of undersized trees and bushes. Its distinctive features are a long dry period without rain falling on winter and spring months, and plentiful rains and thunderstorms in summertime. 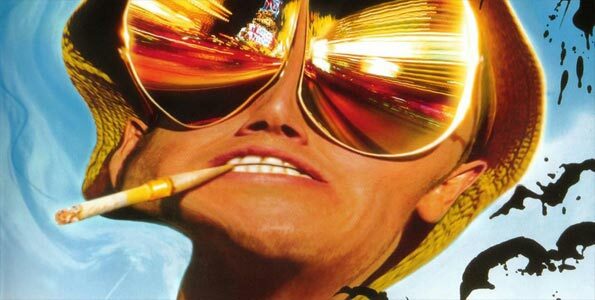 Fluctuations in temperature reach 20 °C and more. 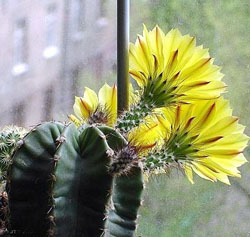 Such climate is considered to be the most favorable for cactus types growing on these plains. 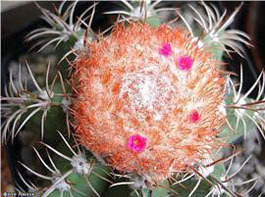 The most popular of them are coryphanta and mammillaria. 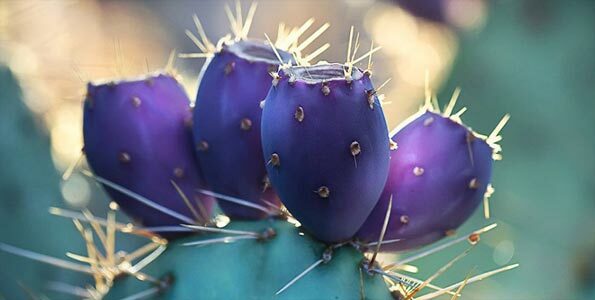 These types of cactus excellently bear dry and cool winter and need a lot of warmth, sun and watering in summer, but they are afraid of water stagnation near their roots. The soil for these cacti should contain less humus, than the soil for forest cactus species, and it should have an admixture of loam. By the way, the majority of savanna cacti, especially undersized ones like mammillaria, grow well in penumbra. In natural conditions they hide from the sun in thick grass. There’s such a popular belief that all forest cactus types are bare and defenseless. But it’s far from being true. There is a whole group of cacti named Hylocereinae or forest saguaros, which texture differs under the influence of life conditions. Here belong such cactus types as aporocactus, hylocereus, celenicereus, chamaecereus. Forest saguaros have thin and flexible creeping stalks and air roots on them, which deliver additional moisture from the air. As a rule, saguaros grow close to the edges of the forest, where there is more light and the air circulates freely between the trees. In case of drought their stalks wrinkle, but with the first rain they become juicy and green again. 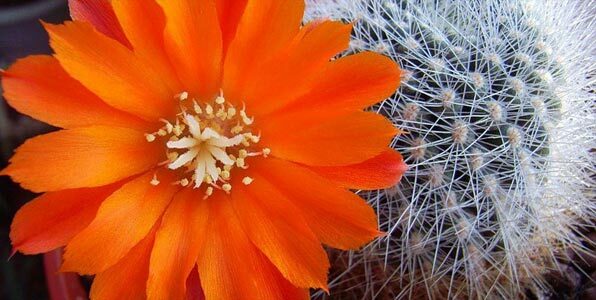 That’s why these types of cactus belong to another group of cacti – to xerophytes. This group is much bigger than the group of epiphytes, and includes various species from different areas of habitation. 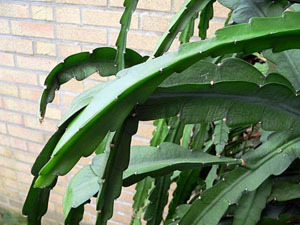 Hylocereinae already have the means of protection from the excessive water evaporation or overheat of the stalk. For example, grey wax bloom and short but strong thorns of celenicereus, a countless number of small setaceous barbs of aporocactus and chamaecereus, etc. Here belong such cactus species as melocactus, copiapoa and some others. This time I’m going to tell you about one of them. Growing just by the sea, very close to the surfs, such types of cactus as melocacti are sometimes washed and taken away by the water. You can find them along warm coast of Mexico, Guatemala, Venezuela, Cuba, but most of these cactus types grow on the islands of West Indies. One legend says that the first melocacti come exactly from those places. Caught from the sea by sailors, they quickly spread in Europe. 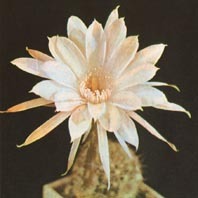 As a matter of fact, melocactus was one of the first cacti got to Europe and described in botanical books. The roots of seashore cacti extend far under the surface of sand ground to gather more fresh rainwater. All year long these cacti need warmth (about 20°C) and humid air; therefore it’s extremely difficult to grow them as houseplants. They prefer mainly sand soil with an admixture of loam and humus, and they can’t bear alkalic soil. Have you ever heard about such cactus types as epiphyllum, rhipsalis or schlumbergera? Certainly, you did. These epiphytic cacti of rainforests grow in moist and sultry woods on forks of branches, in hollows and on stubs. They settle on leaf humus, so their roots are short, but very branchy and clutch at any crack or a ledge on a tree bark. These cactus plants grow all year long, because there are no seasons of droughts and colds in the rainforests. Thick leaves always cover these types of cactus from the sun, causing shading, that’s why they don’t need to have such means of protection against overheat of the stalk like a thick skin, a wax bloom or fuzz. 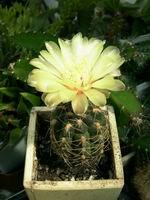 Epiphytic cactus types grow in damp atmosphere and they have no need at all to save water. They absorb it from the moist air around thanks to a bulk of stomae on their wide stalks. You can always recognize these cactus types: their stalks consist of many thin sprouts, and they look like dendritic leaf-shaped plates. They are bare and unprotected and need warmth and moisture the whole year round. Following the advice of many cactus specialists I’ve placed my schlumbergera bridgesii (Christmas cactus) in the aquarium covered by glass. © 2019 A Guide to the Miraculous Cactus World. All Rights Reserved.